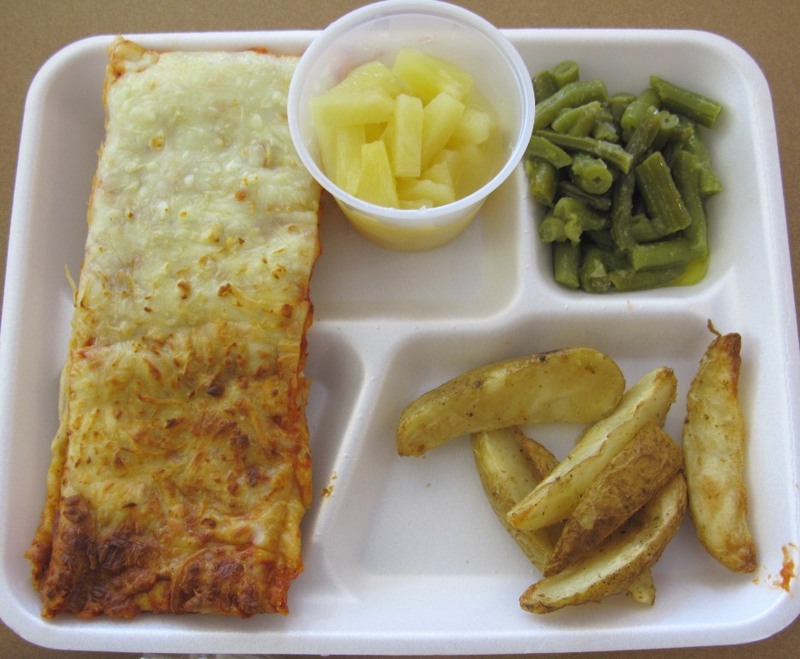 Lunch at a DC public school, (the closest approximation to the pizza lunches I've observed this school year), March 14, 2011. (http://betterdcschoolfood.blogspot.com). Qualifies as fair use under US Copyright laws, as photo is used only to illustrate subject of post, not for reproduction. I’m out of new ideas, old ideas, tried and true ideas. In the three and a half years since my son began kindergarten in Montgomery County Public Schools, he has become increasingly picky and undisciplined about eating his lunch. He eats breakfast, snacks throughout the evening, and eats his dinner just fine. But lunch, oh, lunch — it’s been a struggle. Noah hates sandwiches, ALL sandwiches. He stopped eating peanut butter and jelly almost a year and a half ago. For most of second grade, I bought Noah chicken nuggets, the organic kind from Whole Foods, toast them, put them in a Thermos, pack a separate container with ketchup, and had confidence that he’d eat most or all of it. Then last March, I did one of my random lunches with him at his school, only to discover that Noah had been throwing away his lunch from home, for at least two months according to one of his friends. “The nuggets are too hard and cold,” he said. My son all but gave up on the lunches served at his school two years ago. By the second month of first grade — October 2009 — Noah would only eat the chicken nuggets lunch or the hot dog lunch. By the end of that school year, it was just the chicken nuggets lunch. Given my observations of two dozen or so lunches served at his school since August ’08, I can’t really blame him. Holmes Elementary’s cold PB&J sandwiches, A.B. Davis’ grilled ham and cheese sandwiches (at least by how they smelled), and Mount Vernon High School’s “murder burgers and suicide fries” would be like eating at Ruth’s Chris Steak House for Noah and his compadres these days. (By the way, thanks Akbar Buckley for the burgers and fries refrain, wherever you are). 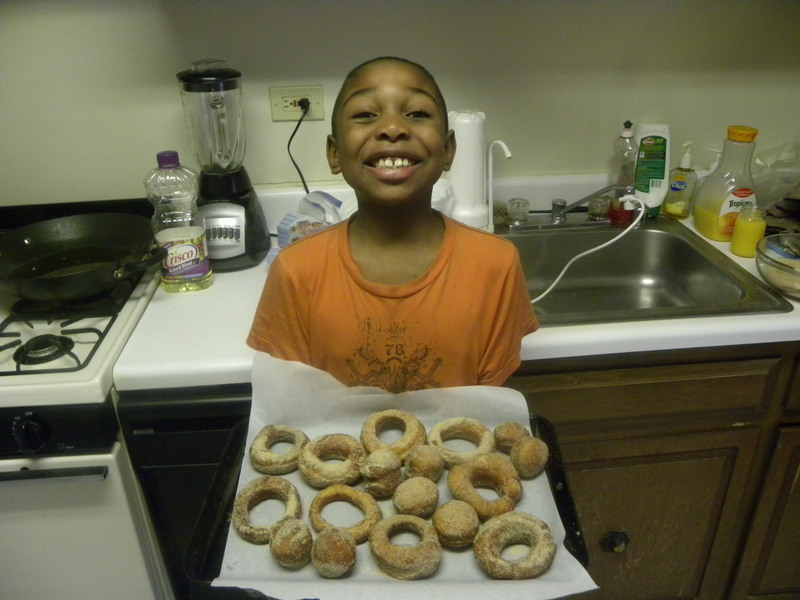 Noah proud of his cinnamon sugar donuts, December 18, 2011 (maybe should serve for his lunch now). (Donald Earl Collins). This is where we are. Noah, like every other student, needs to eat in order to function at maximum capacity academically. But my guess is that the constant noise of his lunchroom and the chaos that is recess is a distraction for him. MCPS’ stripped down budget and bare minimum USDA-approved lunches don’t help stimulate his digestive tract either.